In the past year or so, I’ve not been attending so many dance performances, primarily because I was finding myself routinely bored out of my mind by most of what I was seeing. I kind of gave up on dance. 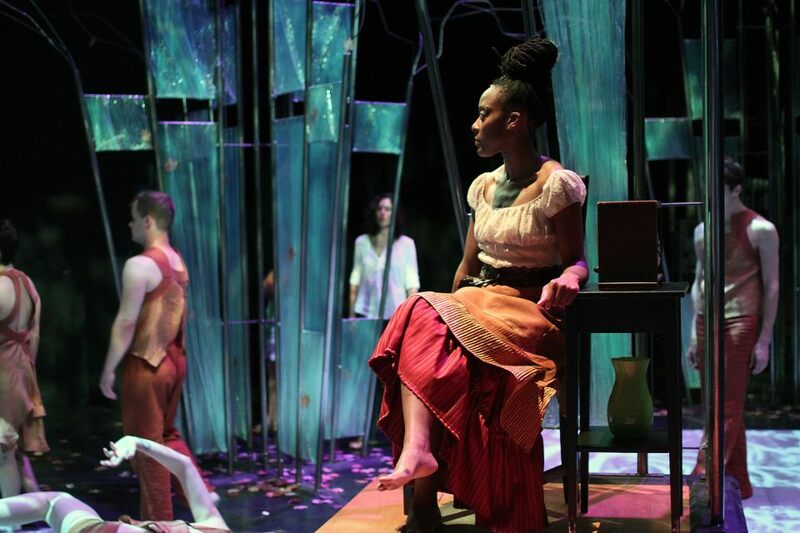 Last weekend, however, Liss Fain Dance premiered its performance installation, The Water is Clear and Still, a collaboration with designer Matthew Antaky and composer Dan Wool, with selected text from Jamaica Kincaid‘s collection of short stories, At the Bottom of the River. It sounded like a performance I ought to check out, not least because of my pal Dan’s contribution to the piece, a subtle and evocative sound score that conjured a variety of shifting moods, landscapes, and textures. Entering the Z Space (the old Theatre Artaud), a venue in which I’ve seen many multidisciplinary dance performances (and co-produced two! ), I was immediately struck by its radical transformation. 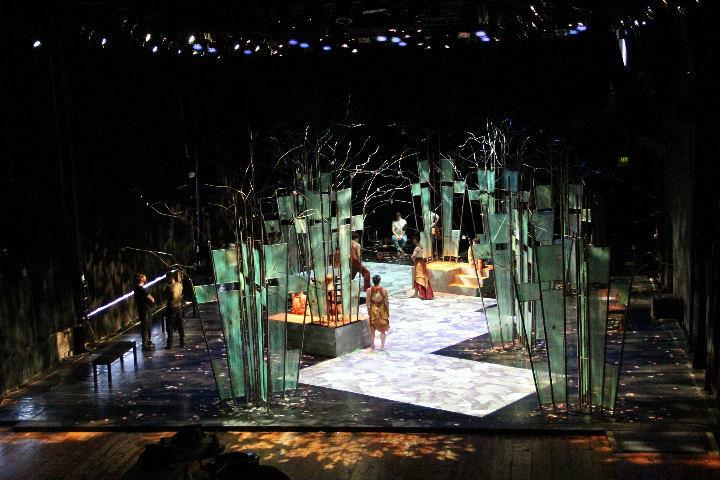 The front bleachers had all been removed, leaving a dark emptiness where the audience normally sits; and the stage, at its full 60-foot depth, had become like a dreamy, under-water forest. Antaky’s installation consisted of several towering, geometric-looking, tree-like structures made with panels of what at first appeared to be mottled green glass. Closer inspection revealed the panels to be ingeniously constructed from pipe and plastic wrap! The majestic “trunks”—all straight lines and angles—were crowned with thin, wiry branches, sparsely adorned with leaves, creating a surprisingly organic effect. Fallen leaves dotted the black Marley. Although the audience was invited to move around the space and perceive things from different perspectives throughout the performance, the dance area, upon which no audience member ought trespass, was clearly delineated by three adjacent white rectangular spaces. Sepia-toned images of twisting branches floated like shadows across the floor, and the green lighting gave the whole environment a sub-aquatic feel. The total visual effect was quite stunning. Six dancers moved between the spaces, seamlessly shifting from solos into duets, into solos again. A dance would begin in one space while attention was already on another, these shifts in attention prompting corresponding shifts in physical perspective. A voice was heard, at first distant and disembodied, but nevertheless fully present. Then amidst the surrounding busyness, the compelling figure of actor Val Sinckler emerged from the proverbial shadows, slowly but surely revealing the true heart of the performance. To say that Sinckler “spoke” or “performed” selections from At the Bottom of the River might be an accurate statement, but it would utterly fail to capture the depth of her relationship to Kincaid’s “stories” (more on that later). If flesh and blood can become a text, then this is exactly what Sinckler did. She embodied Kincaid’s words and images with such clarity and presence that many in the audience, apparently, assumed she actually was the author. My favorite part of the evening was a section called “Girl,” a story consisting of a series of directions from a Caribbean mother to her daughter (the troubled mother-daughter relationship being a recurring theme) on the proper way to do sundry tasks: “Wash the white clothes on Monday and put them on the stone heap; wash the color clothes on Tuesday and put them on the clothesline to dry; don’t walk barehead in the hot sun; cook pumpkin fritters in very hot sweet oil.” During this section, the dancing and the text were at their most integrated. Sinckler moved amongst the dancers, gracefully mirroring their movements, while she offered them various instructions (“This is how you set a table for tea; this is how you set a table for dinner; this is how you set a table for dinner with an important guest; this is how you set a table for lunch; this is how you set a table for breakfast; this is how to behave in the presence of men who don’t know you very well.”). It felt, for the first time in the performance, that the dancing had penetrated to that deeper layer Sinckler’s character already naturally inhabited. It’s hard to know what to say about the text that could truly capture its power. Before this performance, I had never heard of Kincaid, though some of my more literary friends assured me she was a writer of significant talent. During the piece, there was so much going on competing for attention, it was difficult to devote enough cognitive bandwidth to fully absorb the text. And it was clear that it was a text that warranted complete attention. Although described as a collection of short “stories,” Kincaid’s writing jumps between disjointed moments without any over-arching narrative. There are fragments of conversations, recalled impressions, pictures painted. Many things are suggested, though never explicitly spoken. Scenes move between shadows and light, between the beautiful and the grotesque. I wished I was already intimately acquainted with the text, or (given that I wasn’t) that I was better able to focus on it during the performance. At times, I wished the only performer in the piece was Sinckler. 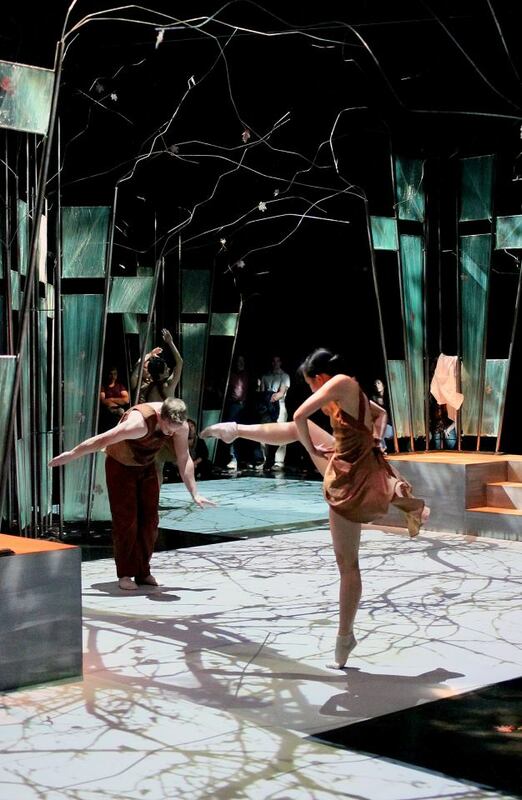 While I appreciated the precision and control of Fain’s dancers, I didn’t find the choreography especially interesting. I wanted to see something with more edge, something that explored the full three-dimensionality of the space, that played more with the particularities of Antaky’s installation, rather than relegating it to the background shape against which some dancing took place. But mostly, I wanted to see less, and understand more. I wanted the dancing to have a smaller role in the entire performance, for it to be used more selectively (and thus, more powerfully). But despite my best efforts to concentrate on the text, it was the dancing that ultimately managed to dominate much of my attention. I suppose, sudden or rapid changes in the visual field is something we are naturally inclined to pay attention to, like when you repeatedly find your eyes fixating on that TV in the bar, even though you have no interest in whatever is happening on the screen. The water at the bottom of the river may indeed be clear and still, but I wonder if the most effective way to communicate that is by pointing to the obvious perturbations on the surface. This entry was posted in Art, Dance, Music, Performance and tagged Dan Wool, Jamaica Kincaid, Liss Fain Dance, Matthew Antaky, Z Space by fenderhardt. Bookmark the permalink. What a great review. Coincidentally, I was at home watching soccer match between US guys and Antigua, from where Ms. Kincaid hails. I had to consult the search engine to distinguish her from Jean Rhys, from a previous generation, from Rosseau, Dominica, 200 km south. Antigua is were Joan Armatrading is from, if that helps. And I had dinner here in Palo Alto at Cocoanuts, run by a Nigerian-Caribbean named Emmanuel Garba. Nonetheless, I am slightly jealous. That you saw the show and could describe it so excellently. As Joseph Campbell said, “We dance”. Isn’t Joan Armatrading from St. Kitts? Or is that part of Antigua? Hi! I’m actually one of the six dancers you saw… I just saw this review now and it was a pleasure to read your reaction to the piece. It’s a very difficult piece to get a sense of when you’re on the inside of it, so I really enjoy hearing what people felt when they saw it. We’re performing it again this season and I’m still figuring out how it goes together! Hi Megan! Thanks for the comment and glad you enjoyed reading. I hear the piece will be performed in NY soon. I hope it goes great!